An all-advanced juicer to accomplish all your juicing needs! The unique and advanced Miracle Pro Green Machine MJ575 Wheatgrass Juicer is designed to give you a supreme juicing experience. With robust architecture and powerful motor, this Green Machine Juicer aims to extract juice from variety of wheat grass and other leafy greens, quickly and easily. And also with stainless steel body it boost high durability and purity. Easy to clean and easy to operate this juicer is a must for wheatgrass juicing. Easy to Operate, Easy to Clean! For wheatgrass and other leafy greens. Miracle Pro Green Machine MJ575 Wheatgrass Juicer is an impressive, advance NSF�Certified commercial grade electric juicer. It easily and effortlessly extracts juice from wheat grass and other leafy greens. It is best at discriminating juice enthusiast as well as juice bars. Built with stainless steel, it is highly durable and rugged. 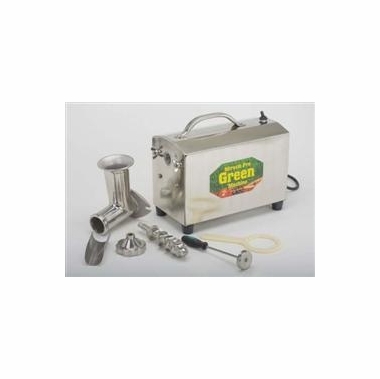 Miracle Pro Green Machine Juicer features advanced new auger design that facilitates maximum juice extraction, leaving driest ever pulp behind. It also equips a specially geared down, ultra-quiet, low rpm motor, which ensures that it can be straightaway untwisted and pulled into the juicer at the time of grass becoming tangled and clogged. I've worked with this juicer before and I just had to have it! Juices perfectly, never jams or over heats. Couldn't ask for anything more. Also, shipping was quick! We are in a retail food operation open 360 days a year, juicing large amounts of wheatgrass daily. We started with a high end, highly rated, double screw juicer but found that inattentive employees regularly damaged plastic parts on it, causing expensive replacements. Someone sold us a gently used Miracle Pro three years ago and we snapped it up and put the fancy juicer in storage. This machine is a workhorse and its hard for even the most inattentive employee to mess up. We're opening up an additional location, and rather than taking the other out of storage, bought another Miracle Pro because we know it is solidly built, reliable and we're not going to have any problems with it. Can't recommend it enough, and wouldn't buy anything else. The quality of the wheatgrass is essentially important when juicing with this machine. When I receive dryer batches, it takes a great deal more to get the machine juicing. Overall, great machine! I was using the omega juicer for juicing wheat grass but the blades constantly broke. If you juice a lot of wheat grass the miracle MJ575 is completely worth the extra bucks. Its sturdy, reliable and efficient.